TORONTO, ON, August 31, 2011 — For the second consecutive year, Paradigm Public Relations has the honour of being named to the PROFIT HOT 50. 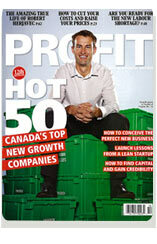 The PROFIT HOT 50 is the definitive ranking of Canada’s top new growth companies. Four-year old Paradigm Public Relations was ranked 28 on the 12th annual PROFIT HOT 50 ranking, reflecting the agency’s 311% growth over the past two years. A brand marketing communications agency based in Toronto, Paradigm has grown from two to 22 employees with a client roster that includes TD Bank Group, Energizer Personal Care, Molson Coors, HTC and PokerStars.net. Paradigm was one of just seven marketing services companies to make the PROFIT HOT 50 list. Published in the October issue of PROFIT magazine and online at PROFITguide.com, the PROFIT HOT 50 ranks young firms by two-year revenue growth. PROFIT: Your Guide to Business Success is Canada’s preeminent publication dedicated to the management issues and opportunities facing small and mid-sized businesses. For 29 years, Canadian entrepreneurs and senior managers across a vast array of economic sectors have remained loyal to PROFIT because it’s a timely and reliable source of actionable information that helps them achieve business success and get the recognition they deserve for generating positive economic and social change. Visit PROFIT online at www.PROFITguide.com. Paradigm Public Relations (www.paradigmpr.ca) is a Toronto-based, full-service agency specializing in brand marketing communications, corporate communications, issues management and media relations measurement. Its clients include BSH Home Appliances, Energizer Personal Care, HTC, Molson Coors, NBA Canada, PokerStars.net, Timex and TD Bank Group.